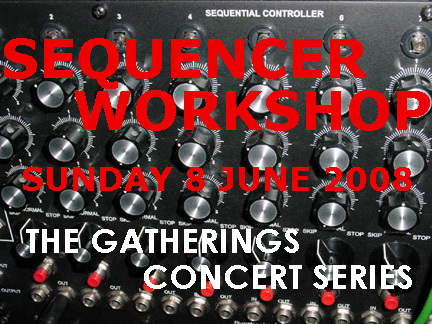 On Sunday 8 June 2008 at 7:00pm The Gatherings Concert Series will present a workshop on the Analogue Sequencer at St. Mary's Hamilton Village. This workshop will focus on the capabilities of the well-known Moog 960 Sequencer Module and is open to anyone interested in learning more about the concepts upon which this hardware is based. If you have ever listened to contemporary electronic music and become curious about how the sequencer functions and is used in the creation process, or are interested in making your own music with such a device, then this workshop is for you! The Analogue Sequencer Workshop at The Gatherings will be headed by veteran synthesist Terry Furber, a leading talent in the field of home synthesizer design as well as in music performance with his Spacemusic duo Orbital Decay (who have performed live for STAR'S END, Soundscapes, The Gatherings Concert Series and Gate to Moonbase Alpha). 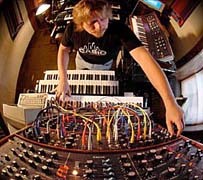 Demonstrating on an array of gear, which includes two Synthesizers.com Sequential Controller modules and a refurbished Moog 1P modular synthesizer, Furber will discuss the history, technology, equipment and basic concepts involved in using an Analogue Sequencer and the realization of music. Attendees will have an opportunity to observe close-up the workings of a sequencer and synthesizer, hear how patterns are created, modified and turned into music and learn how these means might be used in their own creative endeavors. Whether you are a beginner, a music fan or have advanced knowledge, you will come away from this workshop with a better understanding of the sequencer, the people who use them and with deeper insight into and better appreciation of the many genres of music inspired by the sequencer. The primary educational goal of this workshop is to teach the novice the basic operation of the Synthesizers.com Q960 Sequential Controller module. This workshop will cover the essentials a first-time user needs to know about setting up and operating this sequencer. 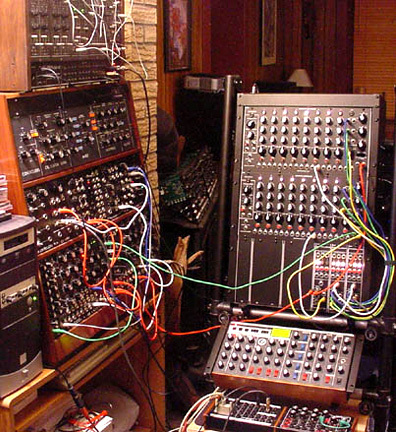 Concepts to be covered include: connecting the sequencer to a synthesizer, selecting a series of notes and their attributes, using a quantizer in conjunction with the sequencer, and ultimately, insight into how these components and concepts may be integrated with the aim of realizing musical expressions. Analog Sequencers were the first generation of music sequencers. Their peculiarities and limitations left a lasting stylistic imprint on Berlin School Electronic Music, and hence, indirectly, in many later rhythmic synthesizer-driven music genres. At its most basic, an analog sequencer is nothing but a bank of potentiometers and a "clock" that steps through these potentiometers one at a time and then cycles back to the beginning. The output of the sequencer is fed (as a control voltage and gate pulse) to a synthesizer. By "tuning" the potentiometers, a short repetitive rhythmic motif or riff can be set up. The most commonly used analog sequencer was the Moog 960, which was a module of the Moog Modular Synthesizer. It consisted of three parallel banks of eight potentiometers: the three banks could (for example) either steer three different VCOs to allow three-note chords in the sequence. Under each of the eight steps, a switch offered three options: play this step, skip this step, or loop back to the beginning. In order to avoid the monotony of endlessly repeated sequences, pioneering e-musicians like Chris Franke of Tangerine Dream and Michael Hoenig would manipulate these switches in real time during performance, adding and dropping notes and beats from a sequence. Also, the "pitch" row can be patched to two or more oscillators tuned to intervals, and the oscillators mixed in and out one at a time. Good examples of all these techniques can be heard on the Phaedra, Rubycon, Ricochet, and Encore albums of Tangerine Dream, as well as on Departure from the Northern Wasteland by Michael Hoenig. By synchronizing two sequencers, and manipulating them individually, swirling polyrhythmic phasing patterns (as introduced in minimalist music by Steve Reich) can be set up. The title track of the abovementioned Michael Hoenig album is an excellent example. An additional module (Moog 962) allowed "daisy-chaining" the three rows to form one longer 24-step sequence. In addition, a switch on the 960 itself allowed the third (bottom) row to be used for note lengths. The output voltage of the sequencer can be added to the output voltage of a keyboard controller, and the latter used to transpose the sequence on the fly. Klaus Schulze was particularly fond of this technique, which lays the musical foundation for tracks like "Bayreuth Return" from Timewind, "Floating" from Moondawn, and indeed pretty much any rhythmic piece from Klaus Schulze's "analog" years. Vangelis and Jean-Michel Jarre likewise availed themselves of this technique. Except in a temperature-controlled environment after warm-up, pitch stability could be problematic. On the famous opening of Phaedra, the sequencer had drifted out of tune, and one can clearly hear Chris Franke retuning the sequence by ear in real time. 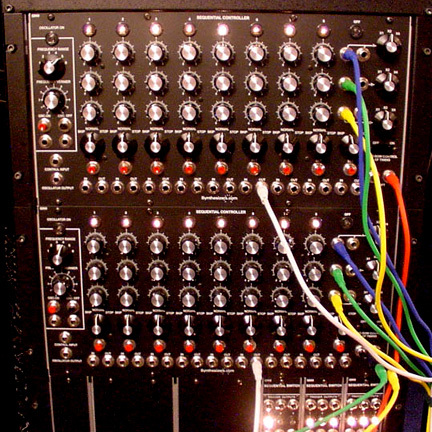 In Part Three in a series of three articles on Modular Synthesizers, author Steve Howell provides an overview of the Analogue Sequencer. Major areas include early technological background, how a sequencer works, the various manifestations and its current relevance in the current digital realm. 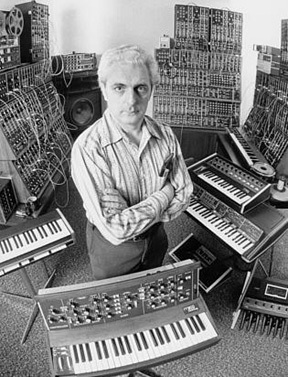 This website provides a glimpse into the history of Moog, a leading designer and manufacturer of Electronic Music instrumentation from 1953 to 1993. The pages are filled with rare, historic photographs and documents collected over the years by a former Moog employee. This webpage mainly describes the UCSC Modular Moog, one that is on the small side, but is representative of most studio machines. Scroll down to the description of the Moog 960 Sequential Controller Module for basic insight. Synthesizers.com is a company offering their own unique modular analog synthesizers and components. Their Q960 Sequential Controller is a recreation of Robert Moog's famous 960 Sequential Controller module. 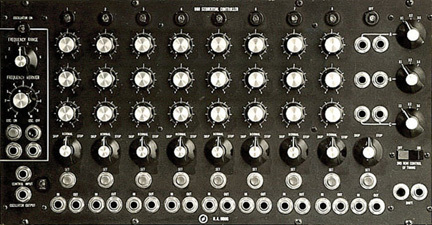 Built using modern components yet retaining the Moog 960's unique functionality (including the highly sought-after skip function, 3rd row timing control, trigger in/out for each stage, etc.) this re-creation offers just about everything contained in the original as well as new useful features. Terry Furber will use two Q960 Sequential Controller modules in his workshop demonstrations. 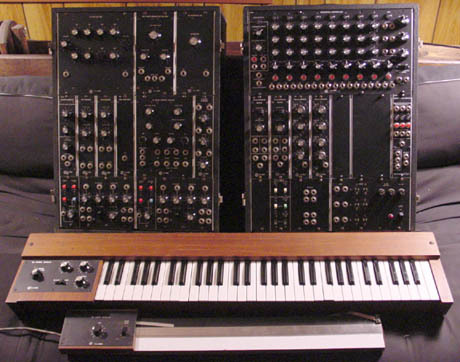 This webpage displays details concerning the Moog 1P Modular Synthesizer and includes a link to the instrument's original brochure. Terry Furber will use his recently refurbished Moog 1P Modular Synthesizer in his workshop demonstrations. This webpage displays details concerning the Roland 100m Modular Synthesizer. Terry Furber will use his recently refurbished Roland 100m Modular Synthesizer in his workshop demonstrations. Modcan Dual Quantizer 55B module contains two discrete circuits, functionally independent and identical and is often used along with Analogue Sequencers to convert continuous signal to DC step output voltage conforming to typical musical scales. This webpage includes MP3 sound clips of various examples of this module's capabilities. Terry Furber will use Modcan Dual Quantizer 55B in his workshop demonstrations. Analogue Sequencer Workshop leader Terry Furber has created and recorded a rhythm sequence which exemplifies the musical capabilities of his Q960 Sequential Controller. Please download the MP3 file below for an excerpt. The Gatherings Concert Series hosts the Analogue Sequencer Wokshop with Terry Furber on Sunday 8 June 2008 at 7:00pm (doors open at 6:30pm) in the parish hall of St. Mary's Hamilton Village 3916 Locust Walk (just east of 40th & Locust) on the Penn campus in West Philadelphia. Requested Donation: $10 at the door. All ages welcome. No previous knowledge of music or technology needed (although helpful).